My phone unfortunately failed me again on our visit to Afghanistan and I have no notes from the experience so I’m going to have to wing this. Ariana is a little hut-like restaurant tucked away next to Mile End park which was bustling on a rainy Friday night, so much so we were worried we weren’t going to get a seat when we first walked in! But they managed to squeeze us in, so we we tucked into our byob supplies (Kronenberg if I recall, very Afghani). The service was quite slow, it took them awhile for them to ask us if we wanted a drink and to ask for our order, though during the wait there was plenty to look at on the walls which were covered in knick knacks presumably from the region. Middle eastern restaurants don’t seem to be fans of minimalist decor! 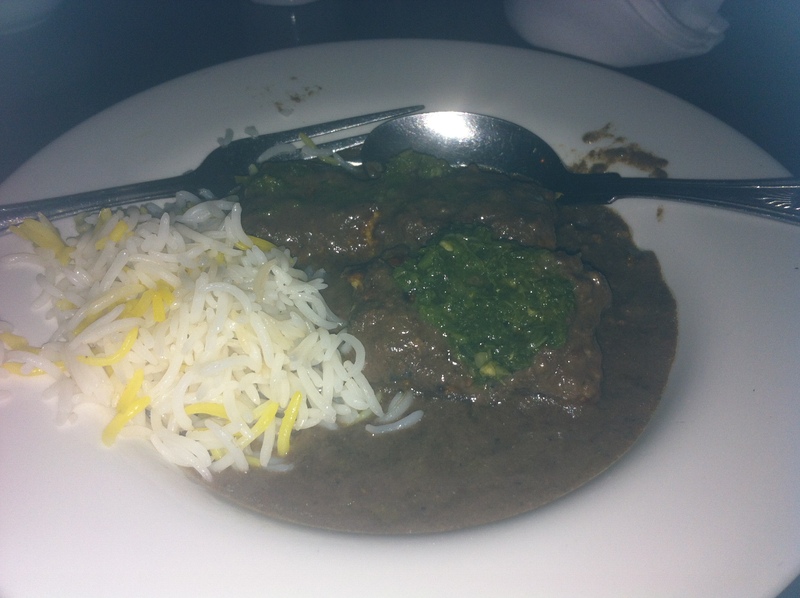 When we finally ordered, I went for the FESENJAN Stew made from chicken, pomegranate juice and ground walnuts served with saffron rice, which was tasty, but I was disappointed with the meat/rice ratio (approximately 3:1) A large plate of rice is too much for one person. I also couldn’t really taste the pomegranates or walnuts. 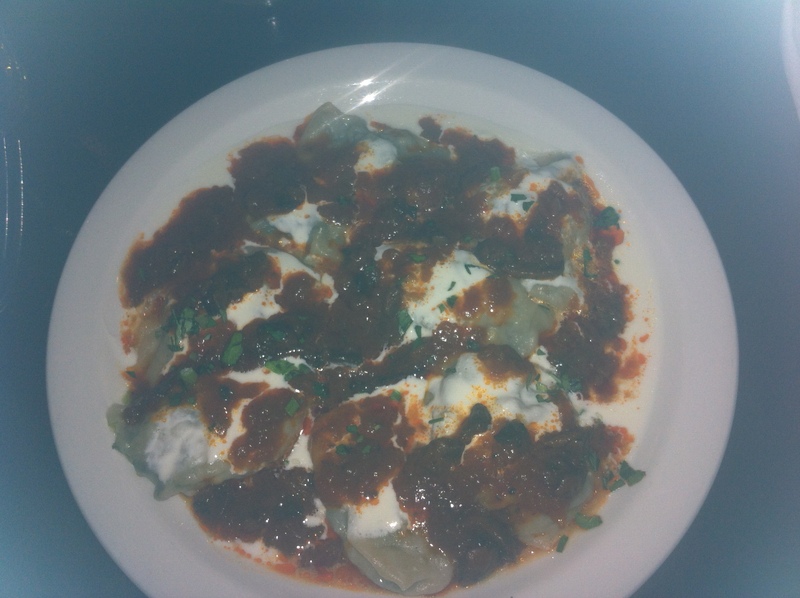 Jodi had ASHAK – wheat flour stuffed with leek and chick peas, served with yoghurt and dry mint which looked and apparently tasted lovely and I had a bit of food envy. Apologies for the terrible photos (even by our usual standard) below by the way, it was very dimly lit in there! I assure you the meals looked much more appetising in real life. We left Ariana warmed up after traipsing there in the rain and energised for a night on the tiles. Would definitely recommend a visit there for an authentic taste of the east to escape from wintery London for a couple of hours. This entry was posted in Uncategorized and tagged afghanistan, byob, Dining, dinner, Dinnergeddon, Eating out, Food, London, middle east, mile end, restaurants by dinnergeddon. Bookmark the permalink.